If you're on a mission for a casual yet totaly chic outfit, consider wearing a black star print sleeveless top and a light blue denim mini skirt. Both of these garments are totally comfy and they will also look great paired together. 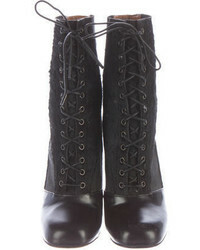 To add oomph to your ensemble, round off with Fendi black leather lace-up ankle boots. If you're after a casual yet chic getup, wear a black and white print long sleeve blouse and a black skater skirt. As well as very comfy, both of these items look wonderful together. Bump up the cool of your look by complementing it with Fendi Leather Lace Up Ankle Boots from TheRealReal. If you're on a mission for a casual yet seriously chic outfit, make a navy and white horizontal striped coat and navy skinny pants your outfit choice. These items are totally comfy and will look amazing paired together. When it comes to footwear, this ensemble is finished off nicely with Fendi Leather Lace Up Ankle Boots from TheRealReal. If you're on a mission for a casual yet totaly stylish outfit, go for a black and white chevron open cardigan and black jeans. As well as very comfortable, these items look wonderful when paired together. Amp up the cool of your outfit by complementing it with Fendi black leather lace-up ankle boots. If you're searching for a casual yet totaly chic outfit, team a charcoal bomber jacket with black skinny jeans. These pieces are totally comfy and will look amazing when worn together. And if you want to instantly amp up the style of your look with one piece, add Fendi Leather Lace Up Ankle Boots from TheRealReal to the equation. For a smart casual ensemble, dress in a beige trenchcoat and a charcoal sweater dress — these two pieces the office pretty good together. When it comes to footwear, this outfit is finished off nicely with Fendi Leather Lace Up Ankle Boots. If you're scouting for a casual yet absolutely chic getup, pair a black mesh sleeveless top with black shorts. Both items are totally comfortable and will look great when paired together. You could perhaps get a little creative in the shoe department and spruce up your getup with Fendi Leather Lace Up Ankle Boots from TheRealReal. If you're a fan of practicality dressing when it comes to fashion, you'll love this extra adorable combo of a black knit open cardigan and black print leggings. To add oomph to your ensemble, complete with Fendi Leather Lace Up Ankle Boots. 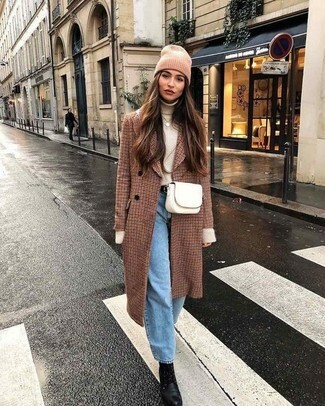 If you're hunting for a casual yet chic look, choose a brown check coat and light blue boyfriend jeans. These items are very comfy and look fabulous when paired together. Kick up the cool of your look by completing it with Fendi black leather lace-up ankle boots.